Are you a creative person looking for unique ideas for hand-crafted gifts? Want to make something that is elegant yet functional? Rhinestone trims are incredibly versatile, affordable, and easy to use. The most common way to use rhinestone trims is on clothing and accessories (hats, belts, head bands and purses); they add a little bling to all things wearable! Trims can also be used in the place of plain ribbon to create an impressively wrapped gift or an unusual greeting card. For those who don't like to sew or scrap-book (yes, we do exist!) rhinestone trims provide embellishments for a great variety of gift items or projects for yourself. Rhinestones come in all shapes, sizes, colors, and even patterns, so it is easy to find the right trim for any project; they help transform mundane into dazzling! Sometimes you don't need a length of fabric; single bows, or hot fix rhinestone appliques add a nice touch, and are simple to affix. Some great pieces to adorn with rhinestone trims are: mirrors, jewelry or trinket boxes, picture frames, compacts, lighters, lamp shades, bulletin boards, and dog collars. Almost any unfinished wood knick-knack/useful small item is perfect to embellish; you can also create awesome holiday decorations and ornaments. Some rhinestone trims have multiple accents like faux pearls, sequins and beads--so elegant! A quick and easy way to interior decorate is to wrap a rhinestone trim around candle sticks, vases, ceiling fan blades, curtain rods, table legs, or anywhere you want to add a little extra visual appeal. 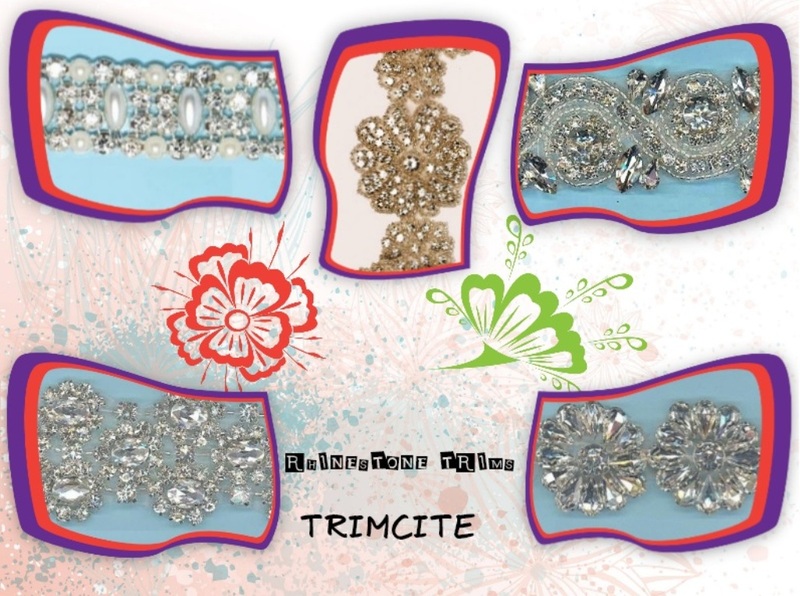 At Trimcite, we’re not only selling the items but we are boosting your creativity to design exclusive dresses by providing vast variety of choices. As we know different dresses requires different kind of styles depending on the material and color; Hence we have appliqués, beaded trims, laces, ribbons, hot fixes, hardware etc. in a different sizes, colors and shapes which can be applied to your dresses. We also have unique styles for making your special occasional dresses such as a prom dress or a beautiful wedding dress. We also carry items for your custom made Uniforms such as security guards or chauffeurs. Many of our clients use our products on Swimsuits and night wears as well. If you’re planning to design a unique dress for the upcoming fashion event or a fancy dress show then do not even bother looking elsewhere. We’ve got it all HERE. At Trimcite, we strive to provide all the latest varieties so it can be your one stop shopping web store. Please go through our latest trimmings. We add new line of items and new styles of trimmings each season. All the decorative accessories for an additional garnishing are different for each season and, hence we do modify our web store with latest trend in the market. Not only trimmings but, we also have Necklaces, buckles, Chains, Rings and other ornaments which can suit your dress depending on the occasion you’re wearing for. We’re a proud supplier of famous designers and our products are a witness in their success. We also take request for custom orders to manufacture unique trimmings, which can be seen only on your dress worldwide. Not only for custom orders but we also welcome our clients to inquire for wholesale quotations of any trimmings. Last but not the least - Quality is our primary goal and not the price.